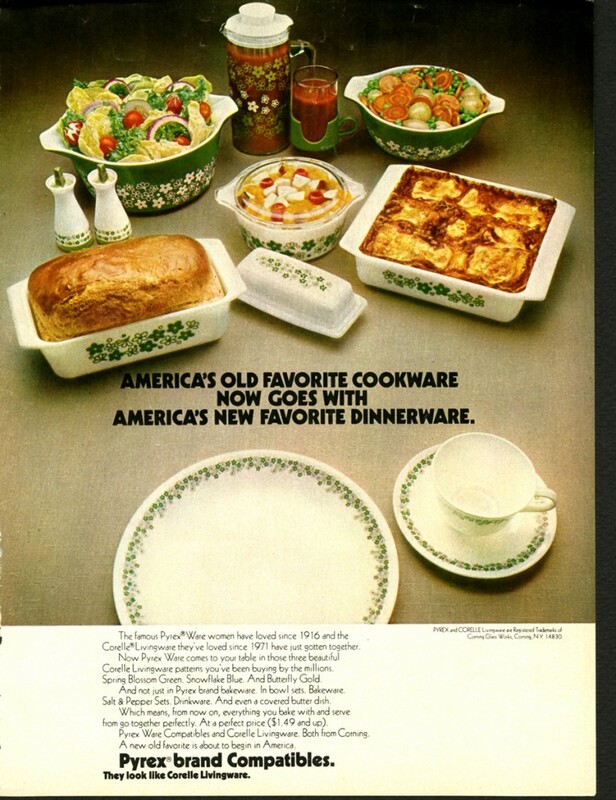 New in the 70s was Corning’s Corelle Livingware line, which also introduced Pyrex compatibles. In 1972, the Butterfly Gold pattern was released as a Pyrex compatible, matching Pyrex kitchenware to the Corelle Livingware dishes. Other compatibles patterns included Spring Blossom Green and Snowflake Blue, each marked as suitable for microwave use. 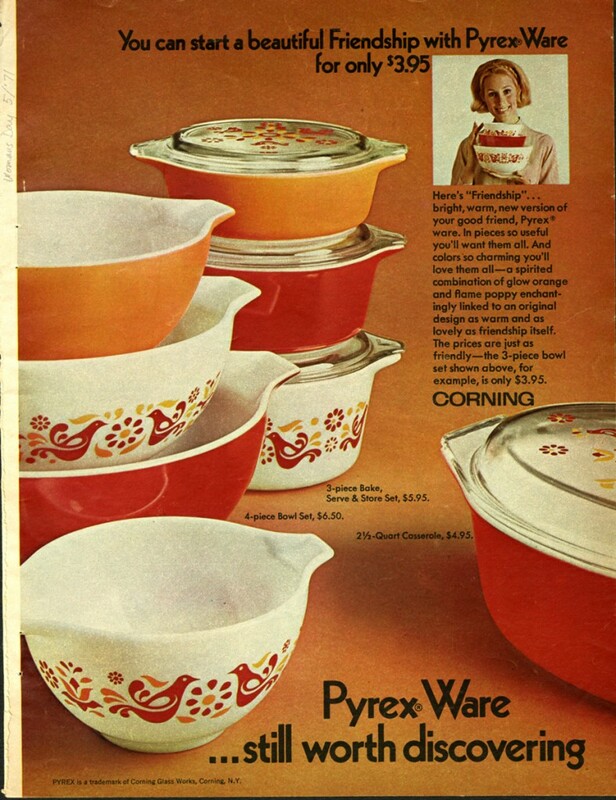 Touted in opening promotions as “giving women what they’ve always wanted in everyday dishes,” Pyrex compatibles were positively received. “America’s old favorite cookware now goes with America’s new favorite dinnerware.” Family Circle, 1972. CMGL 141902. New developments in Pyrex kitchenware weren’t limited to the patterned opalware. Transparent ovenware brought new Sculptured Pyrex; Baker in a Basket; the Bake Around Tube, the Culinara collection; and Fireside glass to the market. The amber-hued Fireside glass replaced Flameware, which was discontinued in 1979, as the top-of-the-stove line. The Culinara collection was a set of clear glass items made to appeal to the needs of gourmet cooks. Items in the line included soufflé and escargot dishes. The Bake Around Tube was introduced in 1976 as a new way to evenly bake foods and the Baker in a Basket, a clear bakeware set in a woven basket, matched the blended décor of the time. 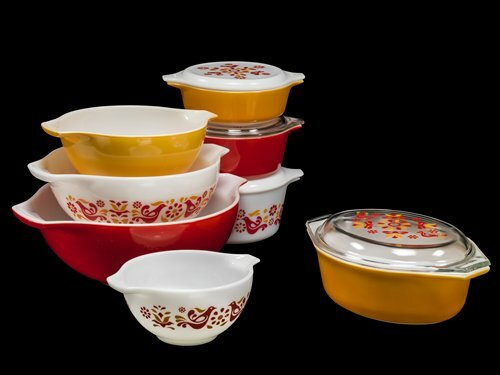 In 1974, Flameglo mixing bowls, noted for its color fading from red to orange, replaced the popular Dot mixing bowls. A brioche pan that doubled as a mold for a chicken mousse was also introduced in the 70s!